It doesn't rain that much here in San Diego. But when it does, we believe in being prepared. Rosy has a pretty pink raincoat with a hood. I don't need to cover my body cause I don't mind being wet. Except sometimes when it rains it is annoying to have the rain go in my eyes. So now I have an umbrella hat ! But Rosy and I refuse to wear galoshes cause we think we would look silly. There are all these babes at the beach and they all want to play with me. If they like fetching and swimming, then I will play with them. But I do make it clear that my heart belongs to Lu. 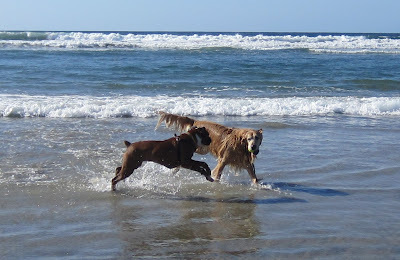 But if they don't like to swim and just like to run around, they are not at all my type. So I try to let them down easy. But this foxy Boxer Roxy just wouldn't give up and kept chasing me. Doesn't she know that it would be a lot more attractive if she played hard to get? Someone said to me that I am their hero. I thought that was SO nice. And then it got me to thinking. What if I was a Super Hero? What would my special power be? Well, everyone always says I make them smile. So I want to be the Super Hero in pursuit of creating smiles around the world. I wonder if my new cape has turbo power cause I have lots of faces to cover! We bought a cake for my blog's second birthday yesterday. As I was nudging the cake over to my blog for the first bite, Mom said to keep the cake away from the computer. Well, I didn't know how else to give my blog a piece, so Rosy, Bunnybell and I just dug in ourselves. YUM! No pizza since Mom and Dad took Sydne for sushi dinner. But Mom promised we can have a birthday pizza for my blog tonight. I wonder if she will let me give my blog a slice. Now I think this calls for a pizza party! On this date in 1848, the California Gold Rush began when gold was found by James W. Marshall at Sutter's Mill in Coloma, California. That is way north of where I live. But it got me to thinking. What must it be like to be a forty-niner panning for gold?. (that is what the gold seekers were called, I wasn't talking about the football team.) 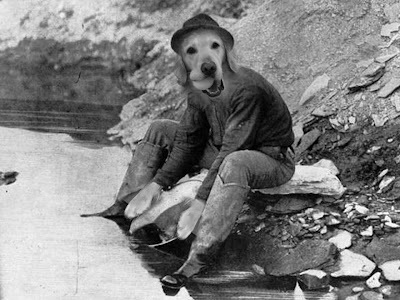 Anyway, maybe I could take my food bowl by the river near where I live and see if any gold floats in it. That would make me a Gold(en) Miner! Today is the beginning of the Chinese Lunar New Year. It is the Year of the Dragon. 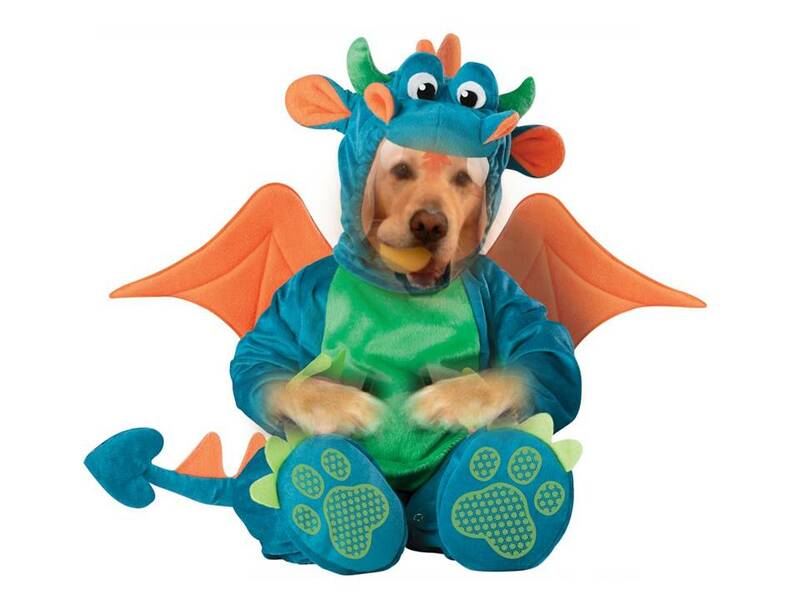 I told Mom that I was a bit scared of Dragons. So she eased my fear by telling me a nice story of a baby dragon named Bear. The dragon was known for his passion, intuitiveness, and superior intellect. Then we googled and found so much to read about the Chinese New Year, also known as Spring Festival. The celebrations last 15 days! Gosh, it sounds like such a fun and delicious holiday! Happy New Year to all those that celebrate! Today is a big day in American Football. It is the Conference Championships. That means at least 7 straight hours of football on TV. 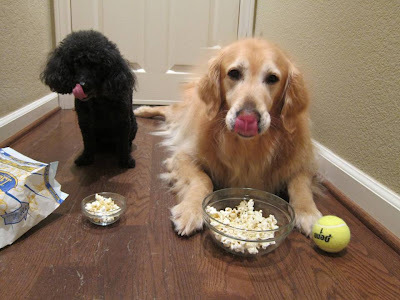 So Mom knew that I may get bored after awhile, so she decided we could play our own football game. That is when I became a goal post! So now everyone gets to score on my head! Wanna play? Mom went out the other day and came home with this weird looking shoe on one of her feet. I asked her where her other new shoe was. 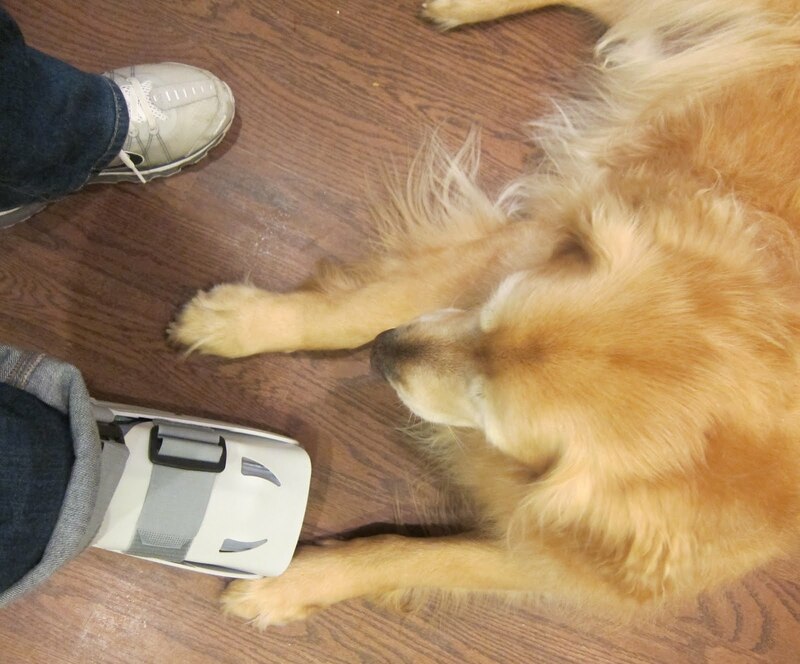 She explained that there is only one, and it is a medical boot. (I was relieved, cause it is really ugly.) Anyway, she has to wear it and stay off her feet! So now Dad has to be Mr. Mom and take care of everything including me and Rosy. To help Dad, I suggested ordering in food so no one has to cook. Maybe Dad will take my advice and order pizza tonight. Paws crossed. And today is yet another food holiday... Cheese Lovers Day! I really would love to personally thank the people that come up with these days! Anyway, I really love cheese. Other than on pizza, my favorite is string cheese. It comes in these wrapped up sticks which Mom unwraps, and then tears the cheese into stringy strips. She dangles them and I usually can't wait until she throws it to me. They are just so yum. Hope you get to enjoy Cheese Lovers Day with your favorite cheese! The other day at the beach I watched this dog play Frisbee. His dad threw the Frisbee and it soared across the sand. The dog leaped high into the air and caught it each time. So I asked my Mom if she would play Frisbee with me. She told me she can't throw a Frisbee so I need to play with someone else. I said never mind cause I just want to play with Mom. 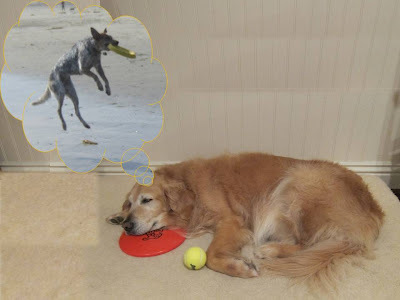 So I will just keep dreaming about the awesome Frisbee dog and remain an awesome ball dog. Today is Benjamin Franklin's Birthday. He was a super impressive guy. Not only was he one of the Founding Father's of the United States but he was an author, printer, political theorist, politician, postmaster, scientist, musician, inventor, satirist, civic activist, statesman and diplomat! I am so inspired by him. And to think I am just an author (blogger). Maybe as I get older I should try to expand my accomplishments. Well, then I better go to bed early. After all, early to bed, early to rise, makes a dog healthy, wealthy and wise. Tonight is the Golden Globes Awards show. It is always fun to see the fashion and see who wins the awards. However, everyone will be on the edge of their seat wondering what Ricky Gervais, the host may say. He can be very naughty sometimes. So I thought I would offer myself up as an understudy just in case he gets too naughty and they need a good boy as a quick replacement. What do you think I should dress up to do today? 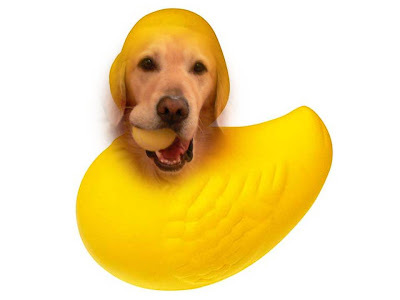 My friend Winslow told me that today is Rubber Duckie Day. That got me to thinking. What would it be like to be a Rubber Duck? Well, it would be fun to get to swim all day, that is for sure. And since I would have no ears, no worry about getting those nasty ear infections. Only problem is I dont think I would like being squeezed all the time . 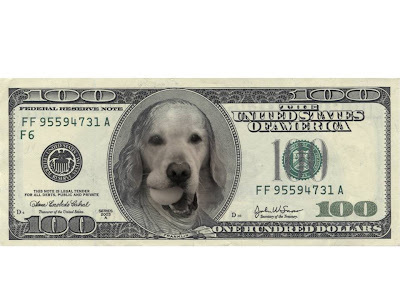 I wonder if the squeeze would make me bark or squeak. Hmmmm. The other day Mom took Rosy to the mall. I thought they went to get Mom eyeglasses. But when they came back Rosy showed me pictures of cars she was looking at. I was a bit upset. Mom never took me to look at cars. I told Rosy that I should get a car first since I have dog seniority in the house. But Rosy said since she is older, she can get her license first, so she could have a car before me. Bummer. Mom sent a gift of pupcakes from me and Rosy to our friend in Florida. A few days later a box of treats arrived from the company thanking us for sending a gift! So I suggested to Mom that we should send more gifts so that I get can get gifts too. She told me to remember that when I give a gift it is to make someone else happy, not me. And there it was, yet another life lesson for Bear. Its really interesting taking a walk with three other dogs. What do we do if we all want to go in different directions? Well, Rosy said the smallest dog should decide. Bunny said the hungriest one should. Buddy said the biggest decides. Sydne said the human decides. But I said the one posting it on the blog should decide. So we got to go my way. I heard that yesterday was Bubble Bath Day. That got me to thinking. What must it be like to have a bubble bath? I always get bathed outside with a hose. A few times I went to the groomers and had a bath, but I don't recall any bubbles. I think Mom would let me take a bubble bath. But do you think she would light some candles and put on some soft music for me? 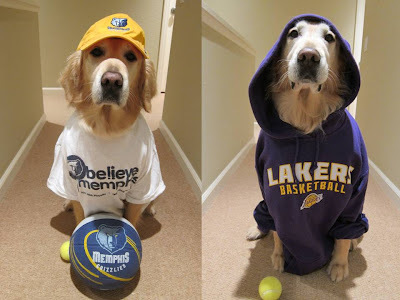 The Memphis Grizzlies play the Los Angeles Lakers tonight. So Rosy and Bunnybell got dressed to cheer for their hometown teams. Bunnybell put on her Kobe Bryant Lakers jersey. Rosy dressed in her Grizzlies t-shirt. 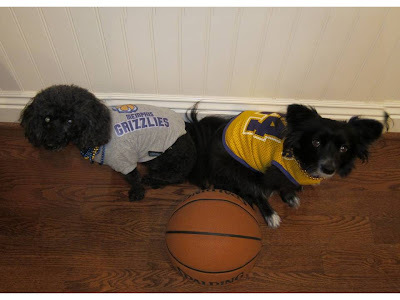 She says even though she moved from Memphis, she will always be a Grizzly girl. But I am in a dilemna. Bunnybell says I should be a Lakers fan now since I live in Southern California. But Rosy says I should be a Grizzlies fan and be true to my brother Bears. What do you think? 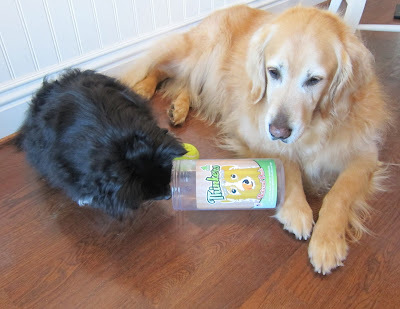 The other day when Mom and Dad went out, Bunnybell pointed out that they left the lid off my Thinkers on the counter. She asked if I could reach it. I stared at the 24 ounce container, full of my favorite treats. I tried closing my eyes and chanted "I am a good boy, I am a good boy" , but the aroma of the Thinkers and BunnyBell's barking interrupted my attempted meditation. So I knocked them off the counter, and Bunnybell ate one and I ate the rest (Rosy was sleeping). I don't think I will do that again, I now know the definition of nauseous. Today is Sherlock Holmes birthday. That got me to thinking. What would it be like to be a famous London detective? I would be able to solve very challenging cases through brilliant dogduction. 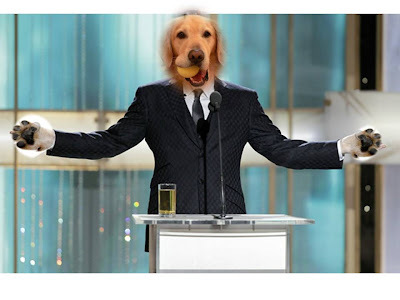 And of course I would bark in an English accent saying somthing like "Elementary my dear Woofson". Today is Mom's birthday. I tried really hard to come up with the best thing to do to celebrate the day. So I decided we should do her favorite thing. 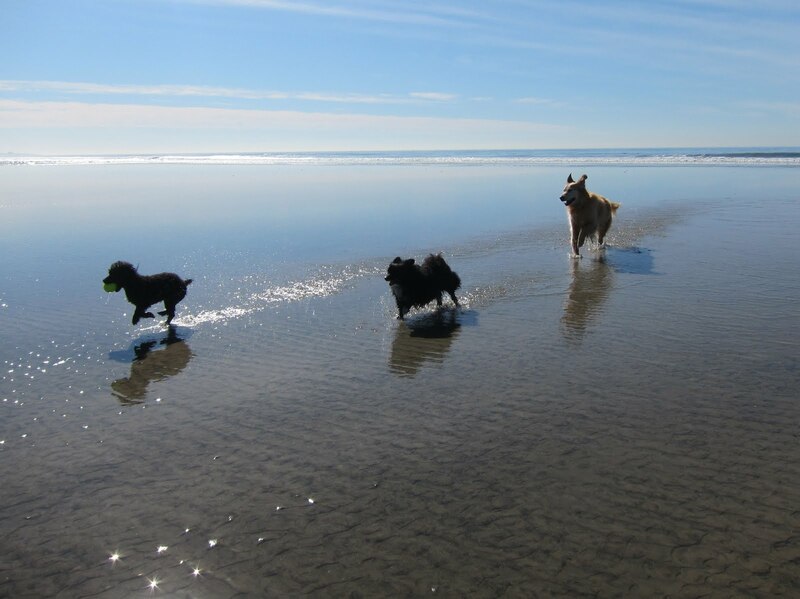 -- taking me, Rosy and Bunnybell to the beach and watching us play. Don't you think that sounds like just the most perfect birthday day? 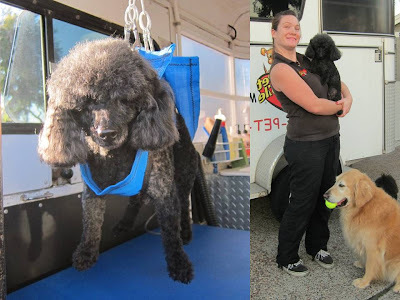 Rosy was looking like a shaggy dog, so Mom called Aussie Pet Mobile. Up drove the spa and in went Rosy. Rosy is not allowed to have anything around her neck, so it is quite the challenge to put clippers near her face without her biting them. 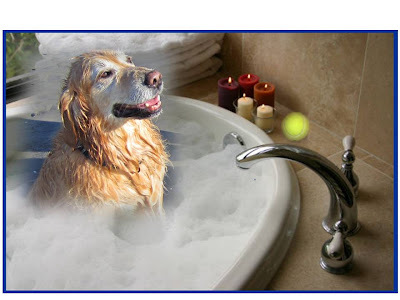 But Laura the spa therapist figured it out. She suspended her in this hammock like thing and Rosy got to fly ! Incredibly cool! Now Rosy is thinking of becoming a flight attendant. 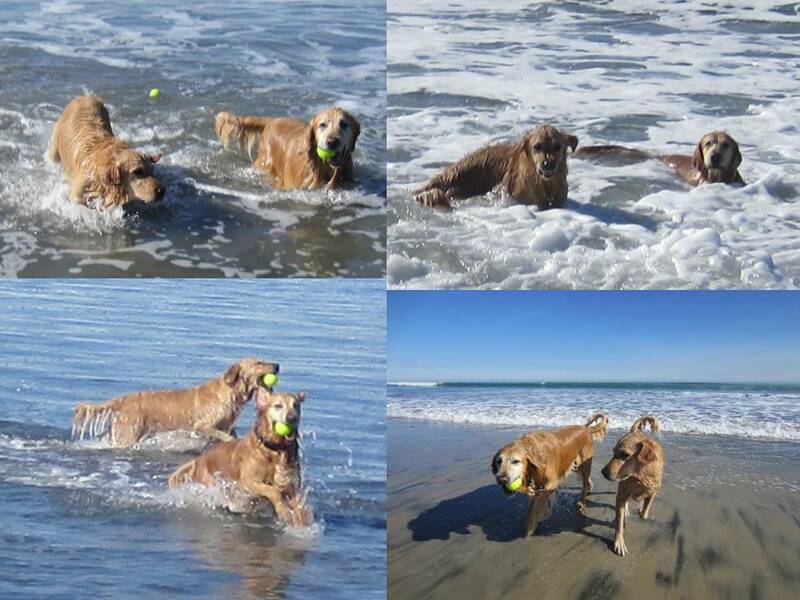 I went to the beach yesterday and fell in love with Lu. I couldnt take my eyes off off her and I just didn't want to leave her alone. Mom and Dad made me take a time out because they said I needed to take a break and give Lu a break too. 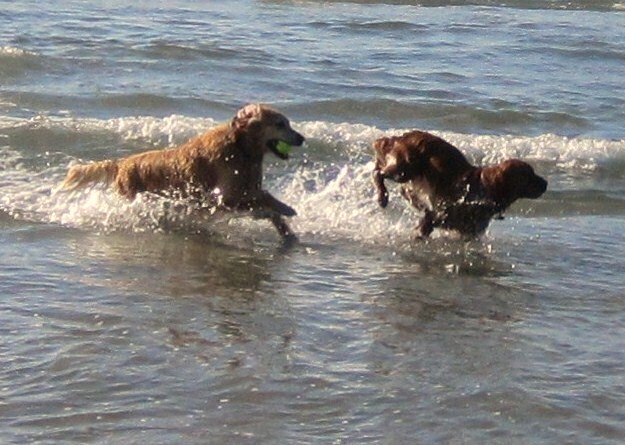 But then I ran back in the water to be with Lu. But she loved me too, so we just played and played. She doesn't live close, but she said she will come back to the beach. I gave her my number. I await her call. One of my New Year's wishes was to have more pizza's arrive. This is not exactly what I meant. I did not want to be the pizza delivery. Mom always said that with all my talk about pizza, one day I will turn into one. Anyone want a slice? Today is the first day of the new year, 2012. It is the day to make New Years resolutions. Rosy said she will try not to show her teeth unless she is smiling. Bunnybell said she will not ask me anymore to steal the bread off the counter. 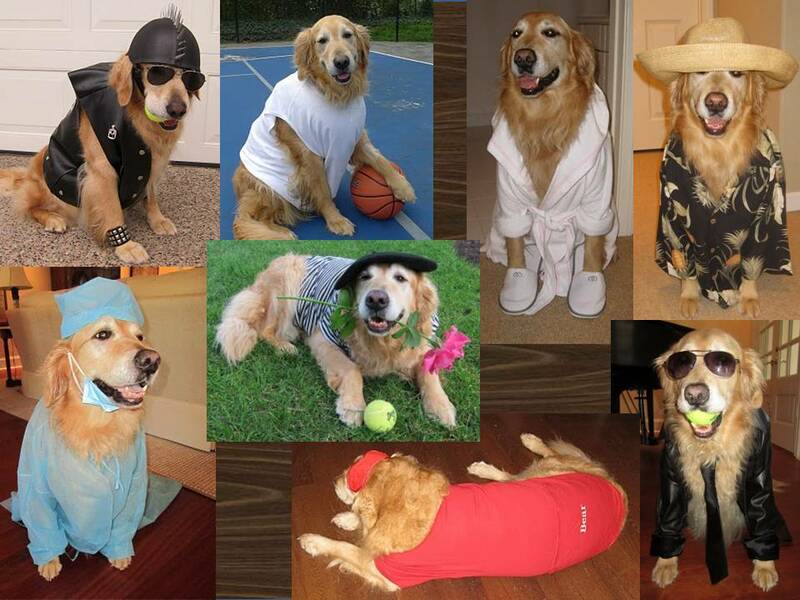 I had a hard time coming up with my resolution because I try to be such a good boy all the time. Some say I am too nerdy. So I told Mom maybe my New Year's resolution should be to be more hip and edgy. And there was the first eye roll of the New Year!